Wow everyone, what a wild ride of a week! I still can’t believe it’s been one whole week since I’ve started blogging and Instagramming–I’ve already made some awesome new friends. The past few days were definitely rocky food wise due to Easter being last Sunday and the slew of leftovers that followed. As you guys already know, I chowed down on some amazing 3 SmartPoint ricotta cookies (which stuck around the house for a couple of days, oops) plus an amazing homemade carrot cake with cream cheese icing that I couldn’t even bring myself to calculate. Safe to say the beginning of the week was a little rough, but I liked to think by Tuesday I was back on track. I stocked up on a ton of grapes this week, both red and green, for a great 0 SP snack for work, or even breakfast. Grapes are something I usually get sick of easily, but they were so sweet this time I couldn’t complain. These snacks definitely helped me become first weigh-in ready! CHIPOTLE! Because I could probably eat this everyday. This weeks bowl was a lovely 6 SP, but then I added my on 3 SP guac and 1 SP Weight Watchers string cheese for a total of 10 SP. Air popcorn with 1 tbsp of whipped butter (2 SP), garlic, salt & pepper! I think I ended up having like 5 cups because I had a ton of points left that day. I don’t know about you guys, but popcorn is my weakness!! Apparently my dog’s too. Workout wise I totally dropped the ball this week. I usually go to the gym Wednesday and Friday morning with my brother before work, but I just couldn’t bring myself to get up this week. Between having these random, mysterious headaches & also staying up super late to get this site up and running, waking up for a morning workout felt impossible. The guilt led me to at least stopping by the gym on my lunch break Thursday (there’s an LA Fitness not even 5 minutes away from my office and I get hour breaks) and I was able to at least walk the treadmill for 30 minutes. Not great but better than nothing! Definitely determined to make the gym happen more this week. 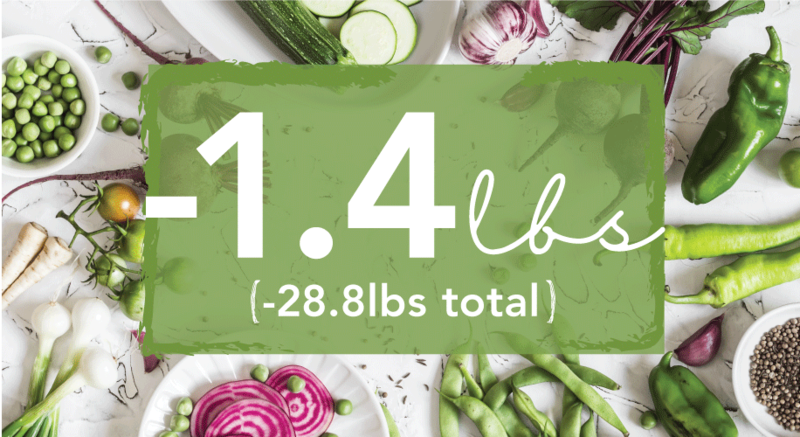 So now it all comes down to my first weigh-In, down 1.4bs this week and 28.8 total! Not too bad all things considered, I hope I can keep this momentum up into the next week. How about you all? Did you guys have a success or not so successful week?